Lytham is well known for its windmill and the open space of Lytham Green adjacent to the Ribble Estuary. Less well known to visitors is that there are two stretches of woodland running through the town that can be combined to make a pleasant stroll. These are Green Drive and Witch Wood. We have visited these many times, but the pictures here were taken on May Day, which is a good time of year to visit as the bluebells were in flower. The entrance to Green Drive is at the roundabout where Mythop Road joins Saltcoats Road. 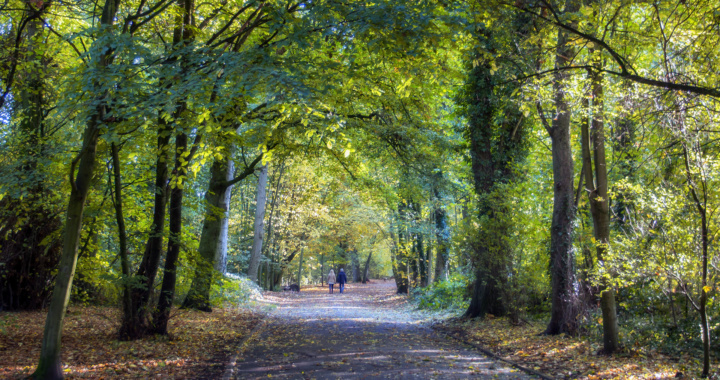 The walk through Green Drive is 0.6 miles along a wide traffic free path, suitable for wheelchairs or pushchairs. Watch out for bikes though, as it is a permitted cycleway. If continuing to Witch Wood, turn left down Ballam Road for 0.5 miles to reach the entrance to Witch Wood, which is off Ballam Road at the railway bridge on the north side of the railway. The walk through Witch Wood is 0.8 miles, but there is an exit to Church Drive after about 0.5 miles. Neither woodland is shown in Google Road Maps, but can be seen in satellite view. A pleasant round walk can be made by returning along Lytham Front, or continuing around Fairhaven Lake before returning along the front. For photography, Green Drive and Witch Wood are probably best in Spring for the bluebells, or autumn for the autumn colours. Lytham is located on the Lancashire Fylde coast, south of Blackpool, and adjoining St-Annes. It can be reached from the M6, either along the M55, turning off at either Junction 3 or 4, or through Preston along the A59, A583 and A584. For Green Drive, there is roadside parking on Mythop Road at the west end, or at Park View at the east end. There are no parking restrictions at these locations. For Witch Wood, there is parking in front of Lytham Railway Station in Station Square, or on Ballam Road on the railway bridge. There are time restrictions in both locations on weekdays and Saturdays, but not on Sundays. Posted in Lancashire and tagged Woodland.